Char-Broil’s budget-priced grill features dual burners that produce 26,500 BTU of cooking heat, and a 280 square-inch porcelain-coated wire grate gives you enough space to cook enough food to feed a small family. Featuring independent controls for each burner, cooking temperature is easy to control. This compact grill is set on two six-inch wheels for easy maneuverability and has a hideaway shelf to hide the propane tank, and tubes. A Piezo ignition button provides a convenient way of lighting up the grill, and two plastic shelves, which are mounted on either side of the central grill, provide additional food preparation areas. This grill also has a porcelain-coated lid and firebox to make cleaning easy. Reviews of the instruction booklet accompanying each of Char-Broil’s budget-range grills are mixed: Some customers have reported them to be clear and precise, while others have stated they are confusing and of poor-quality, taking up to seven hours to construct in extreme cases. Where consumers have struggled to assemble their grill, the customer service department had been able to provide them with assistance. Unfortunately, some consumers have also reported missing parts from the box, but have said that the missing parts were easy to identify due to each part being clearly labelled. 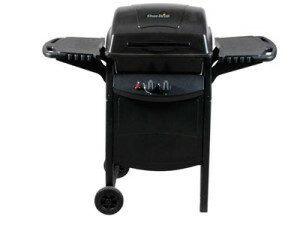 The quality of parts seems to be a definite problem with this budget-priced grill, with buyers stating that the tank shelf is very thin and bends under the weight of a propane tank. Other people have complained that the unit shows signs of rust within a week of buying the unit and that the parts are weak and thin. This Char-Broil grill is definitely a space-saver, with many buyers saying that it is perfect for people with limited-amounts of outdoor space, such as those people who live in apartment building, or that only have a patio area. The unit provides enough space to cook for about six people. The Piezo ignition button seems to work reasonably well on this unit, with few customers suffering any problems with it, but there seems to be a quality issue with thin, tight regulators. Some consumers have reported problems with connector-hose leaks developing within a two month time-frame. The cooking area gets up to temperature within fifteen minutes, but some users have complained that the grill-rack is somewhat flimsy. Food readily sticks to the porcelain-coated wire grill-racks, but a quick spray of cooking oil before use can typically address this problem. The two plastic side shelves do not warp in damp weather unlike other units that have wooden shelves. This is seen as an advantage to many. A final concern about this budget-priced grill is that the heat is distributed unevenly across the cooking surface. Some consumers have taken care of this problem by covering the burners with aluminium foil. This technique seems to provide more evenness of cooking temperature than using the grill without aluminium foil. You can only expect so much from a budget-priced Char-Broil grill, or from any inexpensive grill, for that matter. Rust seems to be a definite problem with all the parts, but this can easily be remedied by buying a PVC cover that will help keep the grill dry during periods of inclement weather. The most serious issue seems to be a safety concern: a thin and flimsy regulator that splits easily. One customer even reported that the unit caught fire because of this.